St. Martin's Griffin, 9781250081810, 352pp. 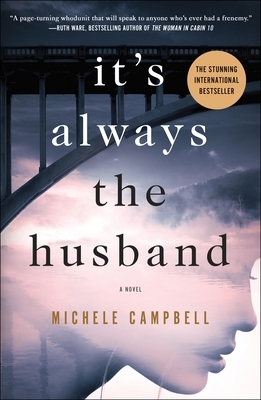 A suspenseful, absorbing novel that examines the complexities of friendship, It’s Always the Husband by Michele Campbell will keep readers guessing right up to its shocking conclusion. Kate, Aubrey, and Jenny first met as college roommates and soon became inseparable, despite being as different as three women can be. Kate was beautiful, wild, wealthy, and damaged. Aubrey, on financial aid, came from a broken home, and wanted more than anything to distance herself from her past. And Jenny was a striver—brilliant, ambitious, and determined to succeed. As an unlikely friendship formed, the three of them swore they would always be there for each other. But twenty years later, one of them is standing at the edge of a bridge, and someone is urging her to jump. Kate married the gorgeous party boy, Aubrey married up, and Jenny married the boy next door. But how can these three women love and hate each other? Can feelings this strong lead to murder? When one of them dies under mysterious circumstances, will everyone assume, as is often the case,that it’s always the husband? A graduate of Harvard University and Stanford Law School, Michele Campbell worked at a prestigious Manhattan law firm before spending eight years fighting crime as a federal prosecutor in New York City. Michele is the author of She Was the Quiet One and It's Always the Husband.